For some reason, it seems that anytime I come up with a recipe idea involving a very specific piece of fresh produce… that item goes out of season immediately. What had been overflowing the shelves in the produce section for weeks on end is just magically GONE, because I finally dreamed up a fun way to use it. And then I spend two months being SO SAD that I cannot get figs/blood oranges/kumquats/fresh artichokes/what-have-you. Eventually, I forget about the recipe entirely, until I am at the grocery store 10 months later and stumble across the item in question – at which point I start franticly rearranging my menu and grocery list, so I can accommodate the long lost recipe idea immediately (before whatever it is goes BACK out of season, clearly). The inside of my brain is a weird and confusing place, you guys. I’m lucky if I can remember where I parked my car in the Target parking lot 6 minutes ago, but the need to find a damn fresh fig will haunt me for months. I can’t explain it. All that to say: the need to make this particular flatbread has been gnawing at me for nearly a year! Luckily, I happened upon some fresh figs at Trader Joe’s about a month ago, and it was finally able to come to life. 1.) Start by making your pizza dough. When it’s ready, preheat your oven to 475°, then stretch the dough out until it’s nice and thin, and place it on a rimmed baking sheet that has been lightly brushed or misted with olive oil. 3.) Bake the flatbread until the edges are nicely browned and crispy, and the goat cheese is a bit melty – about 12 minutes. 4.) While the flatbread bakes, toss your arugula with a bit of olive oil, and a pinch each of salt and pepper. You don’t want it to be super wet, just lightly coated with olive oil – so start slowly, and add more oil if needed. 5.) 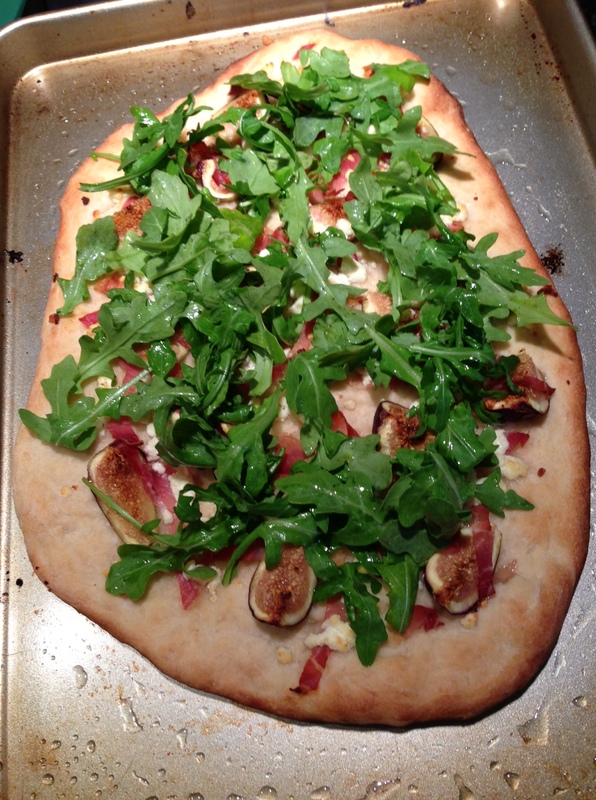 When the flatbread is done baking, place the arugula on top, spreading it out evenly, and cut into small slices. If you’d like, you can drizzle the whole thing with a tiny bit of reduced balsamic vinegar – I was planning to do this, but then I got distracted and forgot (story of my life). Serve warm. This flatbread makes a great snack or light lunch. 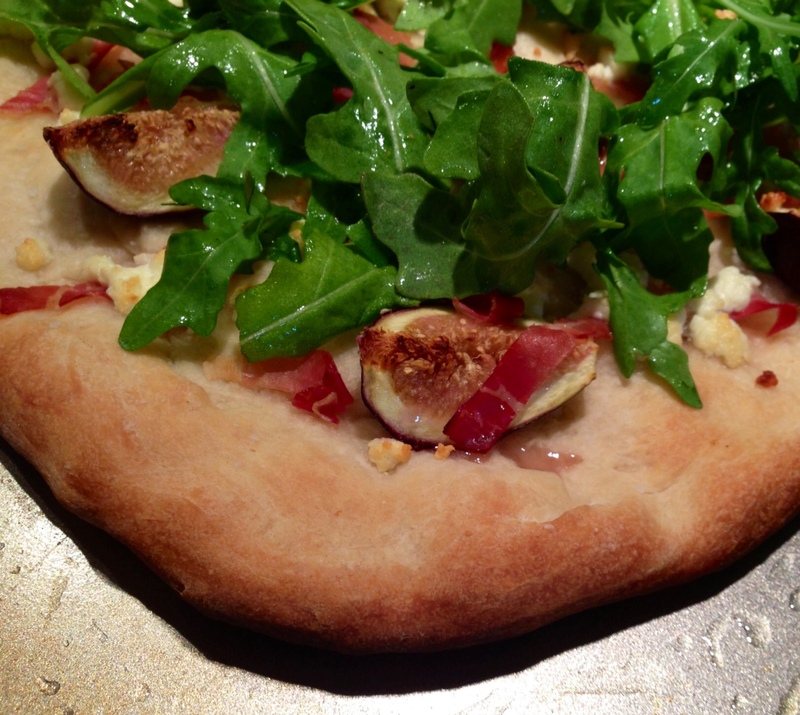 It’s not at all heavy, but it has TONS of flavor – the figs are perfectly sweet (and they get a nice caramely, roasted flavor from baking them), the prosciutto is salty and a little crisp, there’s a nice tang from the goat cheese, and a peppery bite from the arugula. Delicious! 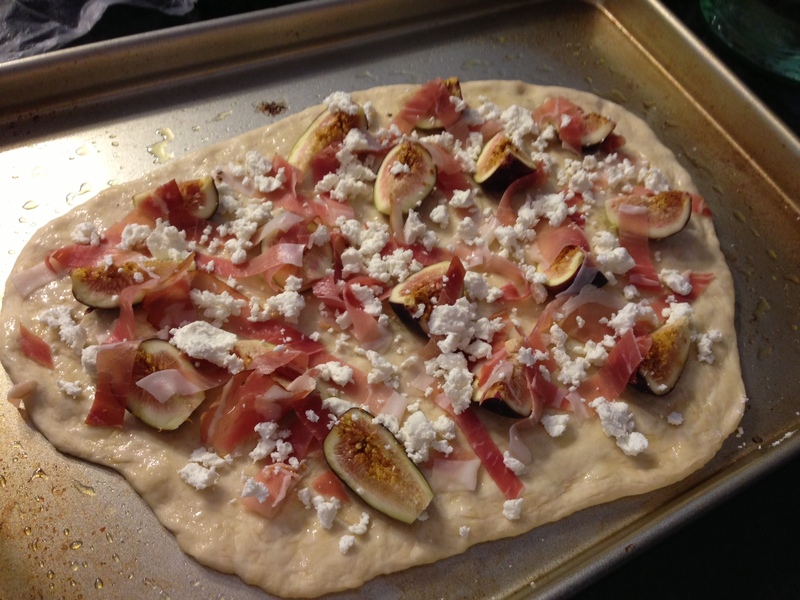 If you wanted to get really fancy (for a dinner party or something), you could cut small rounds out of your pizza dough, and make little individual/two-bite pizzas – each topped with a fig quarter, a bit of prosciutto and goat cheese, and a small pile of arugula. They would look beautiful, and taste even better! Pizza is basically the perfect food, right? There are a million and one ways to change it up; you can add any crazy combination of ingredients that pops into your head! A great pizza joint recently opened up in our area, and they make these ridiculous wood-fired, thin crust pizzas. One of the topping options they offer is roasted garlic, which I love, but have never had on a pizza before. Some friends and I were ordering up some dinner one night, and after about 20 minutes of tossing topping ideas back and forth, we landed on this: sausage, roasted garlic, and tomato. And it might just be my favorite pizza topping combination ever! 1.) First, you need to roast your garlic. While your pizza dough rises, heat your oven to 400°. Place your head of garlic in the center of a square of foil, and drizzle it with a bit of olive oil. Close the foil tightly around the garlic, place it into a small baking dish, and roast for about 40 minutes until golden brown and soft. Allow the garlic to cool until you can handle it easily, and then gently squeeze the cloves out of their skins. Slice each clove into about 4 pieces. 2.) Preheat your oven to 475°. Lay your sliced tomatoes out on a paper towel to draw a bit of their moisture out; lightly season them with kosher salt. Mist your baking sheet with olive oil, and stretch your pizza dough out. Spread a thin layer of your sauce onto the dough. 3.) Evenly sprinkle the sausage and sliced, roasted garlic over the sauce. Cover the pizza with the grated cheese, and then lay the sliced tomatoes on top. Brush the exposed edges of the dough with a bit of olive oil. 4.) Bake for 12-15 minutes, until the cheese has browned nicely. Allow to cool and set for approximately 5 minutes before cutting into slices and serving. 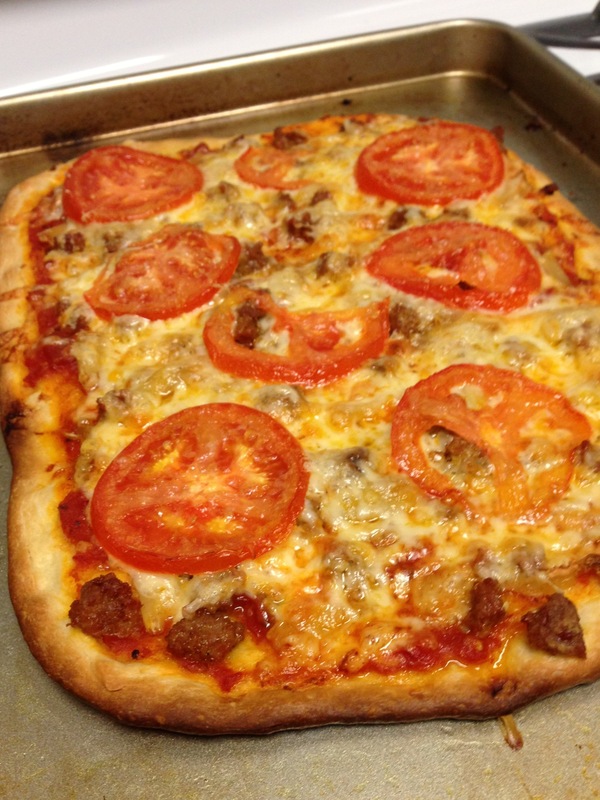 Sweet, nutty garlic, spicy and salty sausage, and juicy, slightly acidic tomatoes. YES, PLEASE. grilled steak and gorgonzola pizza with balsamic reduction. Many moons ago – or, 2 months ago, who’s counting – Matt and I celebrated our second wedding anniversary. At the time we had a lot of things going on around here, so we opted to stay in and cook something delicious in lieu of a fancy dinner out. I marinated the steak the night before, made the dough as soon as I got home from work, and we had plenty of time to reminisce over the past year while we grilled the steak and put the pizza together. This plus a bottle of bubbles equaled a lovely, low-key dinner and was totally up our alley. Prepare grill to medium heat and preheat oven to 425 degrees. Remove steak from marinade and grill 5 minutes per side for medium-rare, or to desired doneness. Set aside and tent with foil. Bring balsamic vinegar to boil in small pan, then reduce heat to medium. Cook until vinegar is reduced by half. Stir in honey and pepper. Set aside. 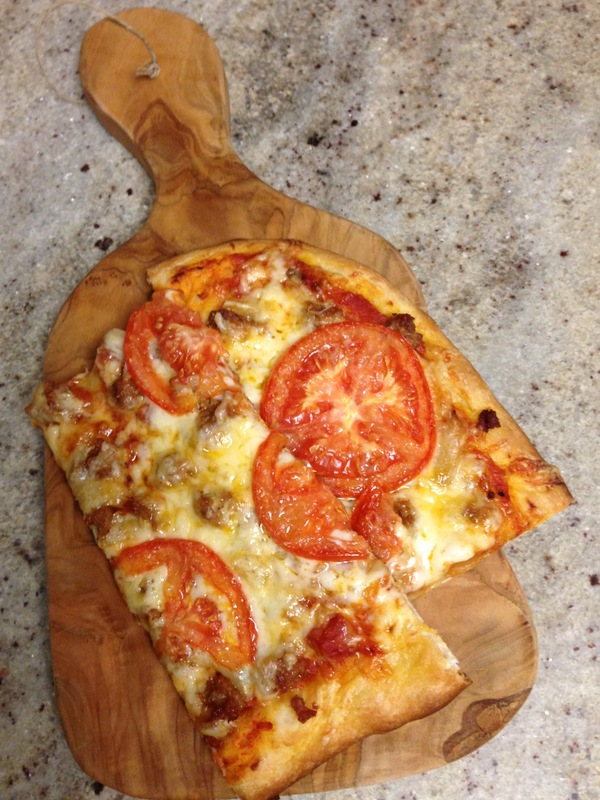 Flour your work surface and roll pizza dough out, brush with olive oil and transfer to a pizza stone or cookie sheet. Bake in the oven until slightly golden, about 10 minutes. Remove from oven and top with Fontina, Parmesan and half of the Gorgonzola. Return to the oven and bake until crust is golden brown and cheese is melted. Meanwhile, slice your steak. 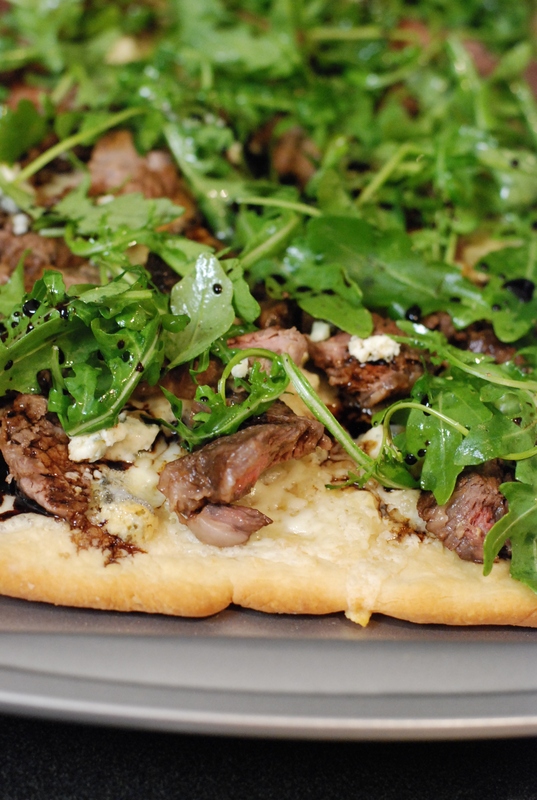 Remove pizza from the oven and top with sliced steak, the remaining Gorgonzola, and arugula. Drizzle with balsamic. Congratulate yourself for creating the most delicious pizza in your own home.